The most important things in life are not things! One ethos for this blog was to keep anything materialistic out of it, I have failed. I agree with the above common saying with one exception. Shoes. Shoes are very important things indeed, I thought they might come under the heading of trifling things, but there is nothing trifling about the delicious enjoyment of adorning a pair of something very beautiful on your distal appendages. I have purchased these. Quirky and I love them. Quirkier the better, but you have to be in the mood, the right time and place. I will in the near future be purchasing these. Wedding material methinks. Thats all, sit back and admire or tell me I am quite mad! Well its been a while and still nothing about food! But he is no slacker and very committed to his job as Agony Dog. Why does my greyhound Maisy grin at me. She gets this big, gummy grin on her face like she's heard a secret joke. What does she think is so funny? 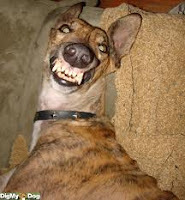 First of all can I commend Maisy on her spectacular grin (be rest assured it is a grin and not a snarl, greyhounds are particularly good at them I have to say). Maisy smiles at you because she thinks you are the funniest thing she has ever seen, in the nicest possible way. You walk on only 2 legs, although us dogs acknowledge that will account for why you cant run as fast as us. You can hardly hear the phone ringing, much less the ice-cream van from 3 streets away. Your nose is so tender that you actually think its disgusting to smell your friend's bottoms. No wonder Maisy has a good laugh when you are around. Besides, she thinks you're the dearest creature, she wouldnt have you any other way and you light up her world and bring the biggest smile of all to her face. 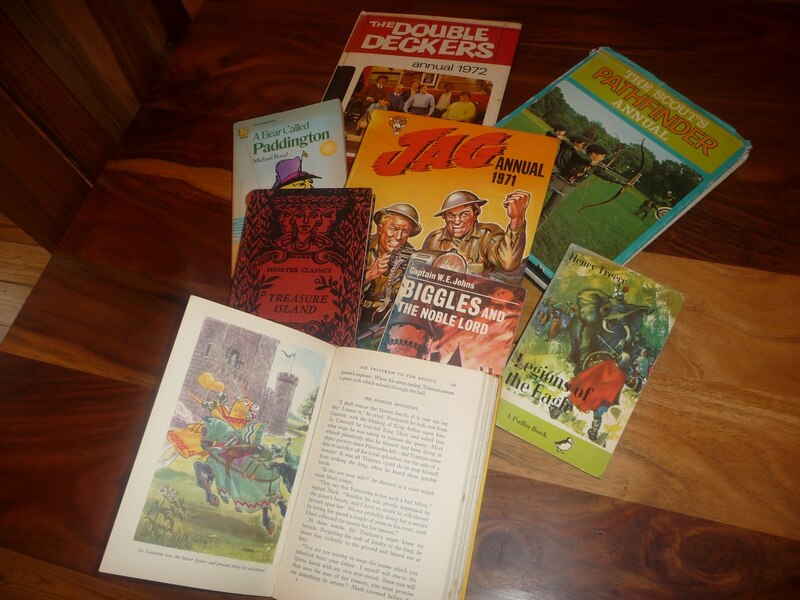 Books and a trip down memory lane? On a dreary, drizzly day Gareth and I decided to have a root through some old boxes in the garage, having long forgotten what they contained. 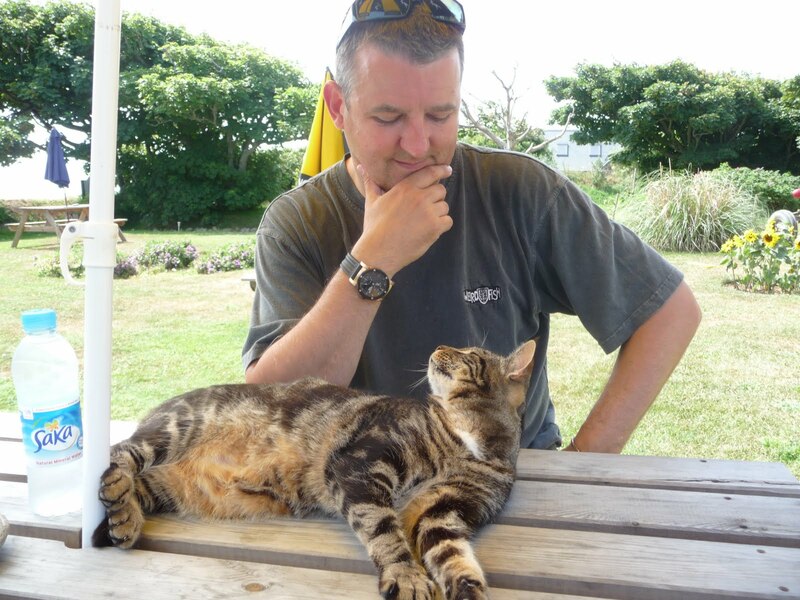 This is Gareth, who I will refer to in the future as the Hubster, because thats his official title. 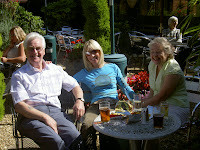 And a very lovely Hubster he is but thats a topic for another day - maybe! We opened the first box and 2 hours later, we were still pouring evocatively over its contents. The first thing that hit us was the smell, that dry, old musty paper smell. 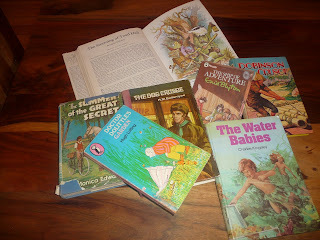 Strewn randomly were some of the cherished books from our childhood. As we both turned yellow aged page, after yellow aged page we were both transported back to 7,8,9 and 10 years old. "Oh wow! I forgot I had that one! ", "I loved this book, look how dog eared it is"
Hubster definitely had rufty-tufty boys books! Well on the main, he got some stick for Paddington Bear! I remember the Water Babies with such fondness as my Grandma would read it to me as some of the words were very long for an 8 year old! Sometimes we comended each others book choices, more often than not Hubster ridiculed my "girlie" selection but one thing is sure, it was a unexpectedly lovely way to wile away 2 hours on a dreary, drizzly day. Back in the box they all went. Neither of us could bear to part with them. Book. Definition: A collection of sheets of paper, or similar material, blank, written, or printed, bound together; commonly, many folded and bound sheets containing continuous printing or writing. No, no, no, so much more than that, just so much more than that. Do you still have your childhood books, do you remember a very special one? My dog follows me everywhere. She doesnt let me out of her sight. Is she worried about me? Or does she find me endlessly fascinating? You see no one has ever been that into me. You are the most delightful and interesting person in the whole world to your dog companion. She adores your every move and will be there just in case you need some extra loving or emotional support. Besides, and I speak from experience, you are the source of her fondest desires - food, walks, kisses and snuggles! 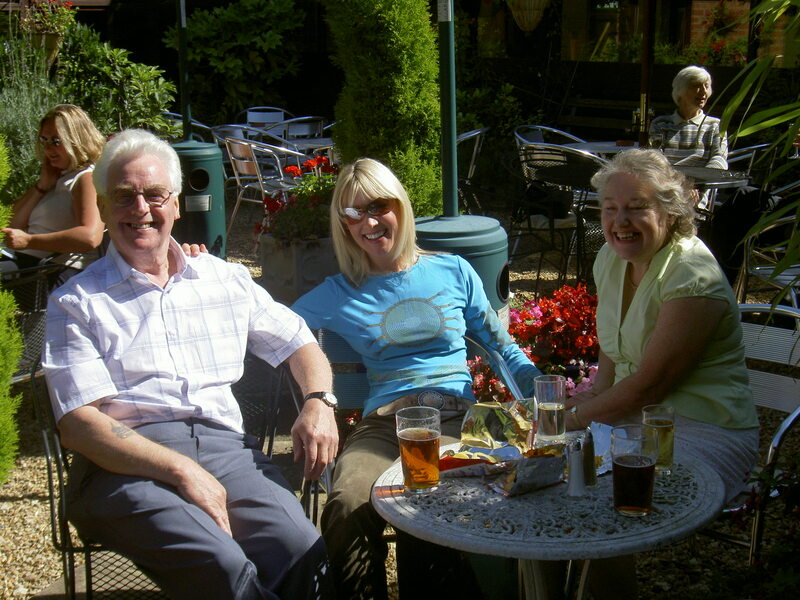 Its 6 months today since my Father passed away. He was only 9 years old. You see if you ever asked him how old he was, he would say I am 9 years old. He really was, at the age of 71 earth years he would still be climbing trees and scrumping apples. 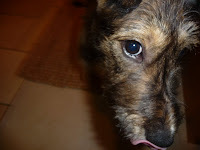 Introducing my fur children, they will feature quite a lot so if you are not nuts about our canine friends, then its probably not the blog to follow. 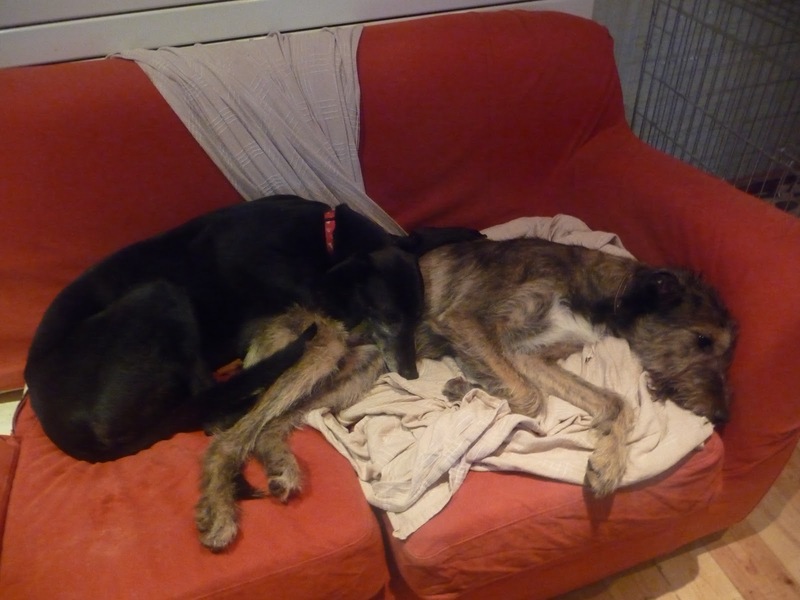 My boys are best friends, Radish the scruffy lurcher, named after a salad vegetable, is a wee 8 months old and a beautiful handful! Sparky is a rescue greyhound, 11 years old and a gentle old boy and extremely tolerant of his young brother! They are both terrible little thieves though, as they have stolen my heart!